Known as the largest social network, Facebook has massive marketing possibilities for businesses looking to increase their reach. Did you know users spend an average of 50 minutes on Facebook every day? With all of that time spent on a single network, your brand has to increase opportunities to reach its audience by following essential Facebook best practices. When Facebook adopted its latest algorithm, the chances of your published content being seen by all of your followers dropped significantly. Facebook purposefully places users’ most sought-after content at the top of their feeds. Your goal shouldn’t just be how to beat the system, but instead increase your odds of making it into those exclusive feeds. Jump to the Facebook Best Practices Infographic. Following Facebook best practices is essential to your overall social media marketing strategy. But it’s important to not only rely on optimal posting times or great content. Instead, you need to focus on your strategy and you can do this by planning out your end goal first. Sun Tan City had a goal of generating more followers and impressions on Facebook while managing more than 500 incoming messages each day. They saw this opportunity to grow by using social collaboration tools to respond to incoming messages faster and more efficiently. In one year’s time, Sun Tan City generated 29 million impressions for its Facebook Pages and increased its following by 79%. If you’re able to put quality time and resources into your Facebook strategy, we’ve seen how well the results can work for you. What’s important is understanding your audience’s needs and how you plan to address them. Facebook can be completely ignored by social media marketers or deemed “too hard of a platform” to see results. On the other hand, if you never put in the effort, how are you supposed to see results? In the past few years, Facebook videos grew significantly in popularity. Thanks to quick recipe videos from Tasty and Chewbacca-masked moms, people turn to Facebook for engaging content. Facebook CEO Mark Zuckerberg has publicly stated that video will be the most consumed content on the platform in the future. In fact, Facebook video posts per person increased by 75% in 2015. This means more people are viewing and sharing video content on Facebook than ever before. Video shares on Facebook grew by 100% over the last year as well. Now more than ever, your business has the chance to take advantage of a flourishing content stream. In the past, the trend was to use images to drive further engagement–which is still not a bad option. However, Facebook videos earn 135% more reach than posts with only an image. So how do you start your video production–especially if you’re on a tight budget? There’s no need to make Facebook video any harder as the platform continues to add easy-to-access video tools. For example, many brands are witnessing higher engagement with video tools like Facebook Live. According to Facebook, videos on Facebook Live are watched three times more than pre-recorded videos. Your business can take advantage of this by hosting live chats or behind the scenes at your office with Facebook live. Encourage users to participate and engage while Facebook Live videos are airing. Need more on video sizes? Check out our guide including all Facebook video specs! Another Facebook best practice for video is to rely on subtitles. Having text on your video is critical to keeping user’s attention. Digiday discovered some brands reporting up to 85% of their videos are watched without sound. The “silent” movement is likely due to mobile users scrolling through feeds in public areas and avoiding using sound. Brands should use subtitles on their videos to keep users’ attention. Don’t overthink your video strategy, but make sure you have the elements to keep them watching. Facebook is unique in the way it can post images, videos, short or lengthy text. However, many marketers see success on Facebook when they’re short and succinct with content. Like we mentioned earlier, keeping your customer’s attention is critical. This is why so many brands have seen success with shorter content on Facebook. Adding a few extra words to your Facebook posts could mean the difference in a viewer reading the entire post, understanding your core message or even taking the time to read it at all. Jeff Bullas, a social media and digital marketing expert, showcased some of the most optimal post lengths for businesses on Facebook. Clinique does a great job at using an ideal amount of characters in its Facebook posts to drive engagement. Let your visuals help boost engagement on posts, but ensure viewers will actually digest your posts with shorter text content. Your Facebook demographics tell you everything about your customers. Study this core group inside and out to know who to target. Your social media demographics can change per network. It’s not easy keeping track of something that’s constantly evolving unless you have the tools to measure and report on your demographics. By using a third-party social media management tool like Sprout Social, you gain in-depth insights to user demographics that go above and beyond what’s provided only on Facebook. 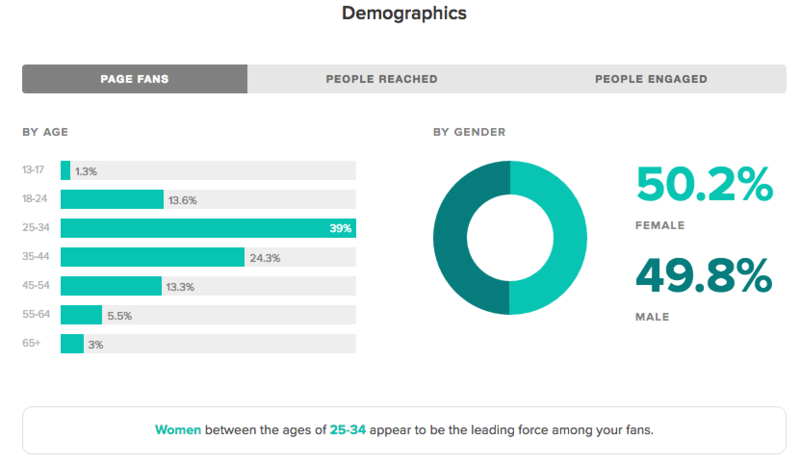 Sprout’s Facebook demographic reports can help paid search, advertising and social media marketing teams hone in on their core audience. Do you know your user demographics? Discover your audience’s gender, age, income, education, location and language. All this information is essential to marketing professionals. Don’t skip it on Facebook. What content works best with your audience? Figure out which posts received the most clicks, likes, shares and overall engagement. Replicate and test successful content types. Testing is critical for publishing the best content on social media. Do all your Facebook ads have the same goal? Without an aligning goal, you’ll try to target too many different demographics with separate content. Limit your plans and narrow down your ad strategy. Social media platforms like Facebook give you several advertising options, but ensure your goal is same per campaign. How do you stand out against competitors? In 2015, 65% of online advertising revenue came from Google and Facebook. You have a ton of competition, so what makes you different, unique or better among the rest? Answer these questions with your ads. If you search for the appropriate amount of posts per day on Facebook, you might get a lot of “well, posting frequency kind of depends on your business.” This is true, but for most brands looking to build engagement and post impressions, twice a day is a good start. The average feed has hundreds of stories filtered from brand Pages and friends. Without overdoing it, at least two posts per day guarantees freshness, consistency and a higher chance to get discovered without annoying your audience. Most people tend to view Facebook at lunch or the end of the day, which makes afternoons and early evenings between 1 p.m.-4 p.m. prime for posting. Don’t stick to exact times when posting. It seems robotic and more likely than not, others are doing the same. Instead, use Sprout Social’s ViralPost. This amazing feature posts your Facebook content when your audience is most likely to be engaged. Take out the guesswork and know you’re posting at the best times with ViralPost. Trendjacking is a social media term that refers to hopping on a trending topic to promote your brand. It’s one of the harder social marketing tactics because it can often backfire for brands. Simply take caution when posting on trending topics, but don’t be afraid to get in the conversation. 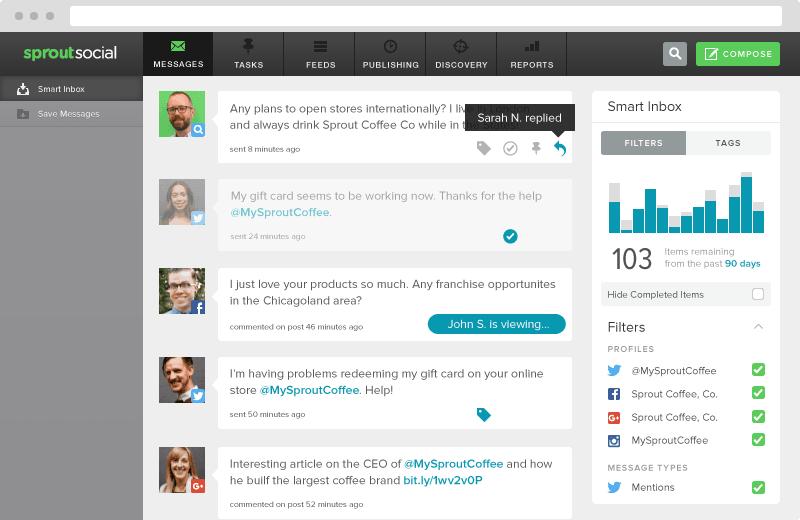 Or you can use hashtag tracking tools to discover what people are saying about you on social. We’ll continue to push visuals for Facebook marketing simply because they work. 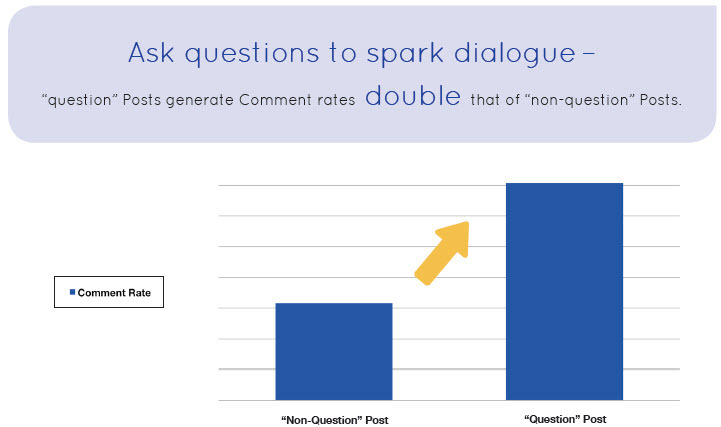 In fact, Facebook posts with an image have an 87% interaction rate over plain-text posts. Use your visuals wisely and always set a high standard for quality. Pixelated and stretched images on your page look bad and show your audience you don’t really care about using Facebook for real interaction or communication tool. Just like we were mentioning, high quality content shows viewers you care enough to put effort into Facebook. Far too often we see businesses with abandoned and ghost town Facebook Pages. Keep a social media calendar to schedule your posts. And continue to push the quality of your content to new levels. If you’re not saying something unique, many Facebook users will skip by your posts. Sprout Social's full suite of social media marketing tools includes a complete set of features to schedule and publish content when your users will engage. Ignoring your potential and current customers on Facebook can be detrimental. Try highlighting your best customers and reply to any questions that arise. Through our Sprout Social Q2 2016 Index, we discovered some essential stats for brands who leave their customers waiting on social media. 1 in 3 customers go to a competitor if they’re ignored on social media. 89% of social messages are ignored by brands. 34.5% of users choose social media as the top choice for customer service. People on social media still use it for its core, original purpose–communication. Just because you’re a brand on social, doesn’t mean you don’t have to respond. The Index discovered 90% of social media users have gone to a network to communicate directly with a brand at some point in their lifetime. Ignoring communication opportunities can kill your social media traffic and ultimately affect your bottom line. By integrating with Facebook management tools, you’ll never miss a message directed to your brand again–no matter how many platforms you manage. Impressions: Total number of times any content from your Page was seen in a News Feed, ticker or by visits to your Page. Post Engagements: Total number of comments, shares or reactions to your posts. Link Clicks: Total number of clicks on links with your content (excludes other clicks such as photo, video or post expansion clicks). 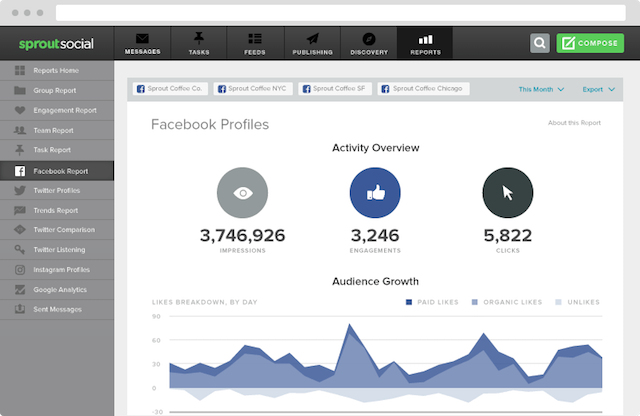 Organic Likes: Total number of new users who liked your Page by organic reach. Unlikes: Total number of users that unliked your Page. Net Likes: Total number of paid or organic Likes minus the amount of Unlikes. Total Fans: Total number of users who liked your Page from the last day or the report period. Having easy access to this data puts you in a whole new league with your competitors. 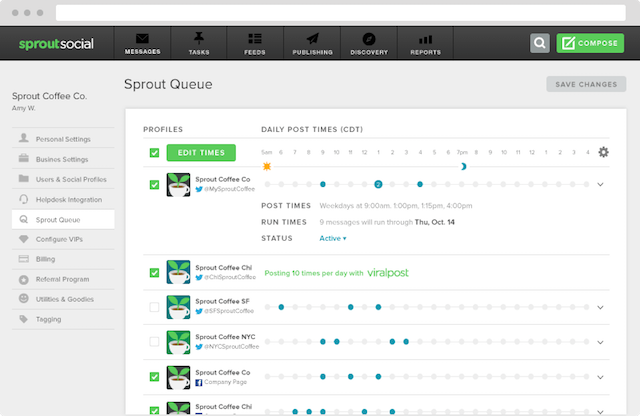 With Sprout you can track your campaigns and make small adjustments on the fly. Don’t rely on tools that provide just one aspect of your marketing efforts. Use something that will cover all your ground and get you ready for success on the world’s largest social media network.